That’s especially true since the advent of the Information Age. Now, it’s even easier to reach people around the world than ever. If you’ve got a product or service with international appeal, you can literally market it to anyone with an Internet connection. However, you still have to invest time and money to get your product noticed by people from foreign countries. That’s why a powerhouse platform like Amazon can make your life so much easier. If you leverage Amazon’s already respected world presence to sell your products, you’ve already won half the battle. The other half is getting people to buy. Here’s what you need to know about selling internationally on Amazon. If you’re at the stage in your business lifecycle where you’re thinking about going international, then it’s a good idea to consider both the benefits and the challenges of that move. In this section, we’ll look at the benefits. For starters, you might already be marketing your products internationally if you’re on Amazon. That’s because Amazon is an eCommerce website with worldwide appeal. Although there are several region-specific Amazon sites, some people from the farthest reaches of the planet might be perfectly content to shop on Amazon.com. And when they do, they might stumble across whatever it is that you’re offering. On the other hand, if you’re not currently marketing your products on Amazon, you can gain trust from people overseas by doing so. That’s because Amazon has a reputation of offering outstanding customer service to folks who buy products on its e-commerce platform. So if you want to give yourself a little head start when you go international, consider using Amazon as your online store. You’ll also lower your expansion cost when you leverage the Amazon brand name. That’s because Amazon has already put in place the infrastructure and operations necessary to reach a global market. On the other hand, if you decide to “go it alone” in your international venture, you’ll find that you have to create a website that supports localization and optimize each regional version of your site so that people can find it online. That’s going to cost a lot of money and lead to a lot of sleepless nights. 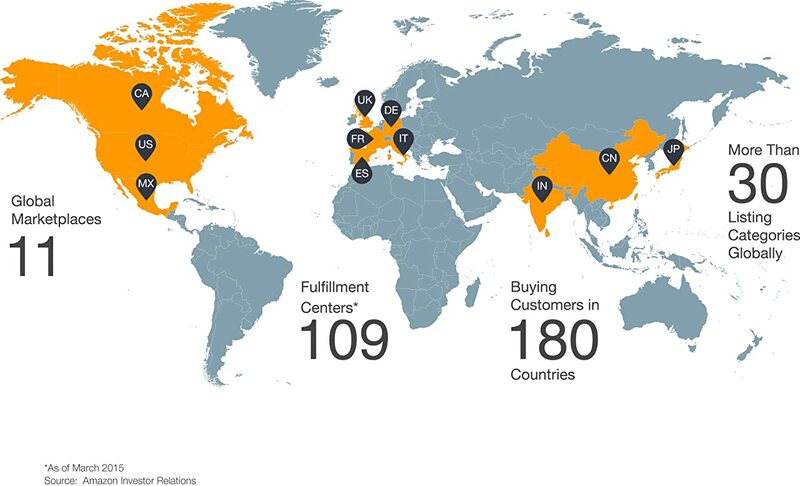 One of the best benefits of using Amazon to reach a global audience is that you can make use of Fulfillment by Amazon (FBA) for shipping and customer service needs. Of course, that service isn’t offered as a charity – you’ll pay a price. But paying Amazon to handle those kinds of basic responsibilities gives you more time to focus on the core mission of your business. Important: if you do decide to go forward with FBA, you’ll need to store your products in Amazon’s fulfillment centers (that’s Amazon’s name for warehouses). That storage will cost you money as well. On the other hand, if you decide not to take advantage of FBA, then you’re entirely on your own when it comes to shipping, handling, and customer service. That’s a lot to put on your plate unless you’re already very familiar with international sales. Speaking of customer service, do you speak the language of the people in the country where you’re expanding to? If not, then it’s safe to say that FBA is your only option. Amazon does have staff in place that can speak with local customers in their native language. Keep in mind, though, that you’ll need to create an Amazon seller account for each marketplace where you want to sell. Usually, the marketplace is country-specific, but Amazon has unified its North American and European marketplaces into one account. European Fulfillment Network (EFN) – Allows you to send your inventory to a primary source country, such as the U.K. All orders placed from Europe are fulfilled through that fulfilment center. Multi-Country Inventory (MFN) – Allows you to store inventory in fulfillment centers in different European countries. That way, you can store your products in a specific region based on customer demand. For example, if you find that people in Spain really appreciate one particular product that you’re selling, then you can store that product in Spain, giving customers in that country a quicker delivery. Another advantage to using Amazon to handle your international outreach is that it gives you the opportunity to scale from a marketing perspective. For example: you might be thinking about branching out into Europe today, but what happens if you want to move into Japan later on? When you use Amazon, you’ll already be working with a company that has years of experience in marketing to various Asian countries. Also, Amazon has a built-in currency converter. The Amazon Currency Converter for Sellers (ACCS) allows global marketers to receive payment in their local bank and local currency. Amazon keeps up with all the exchange rates so that you’ll get every penny you’re owed. Keep in mind, though, that the ACCS option is only available for banks located within Amazon’s 11 international marketplaces and conversion is only available for currencies supported by ACCS. You can click here to see a list of currencies that are supported by Amazon’s ACCS. That link will also show you which credit cards are available for specific currencies. And last but certainly not least, the best benefit of going international with Amazon is that you can increase your sales. It may be the case that you’re close to saturating the market in your home country. If so, Amazon gives you the opportunity to look for some new customers overseas. So far, we’ve made it sound like a no-brainer that you should 1) go international with your business and 2) use Amazon for global marketing. Of course, that’s not the entire picture. It’s certainly the case that you’ll see your fair share of unique challenges when you decide to market your products to people in foreign countries. First, you’re going to have to deal with North American Unified Account (NAUA) inventory separation. That assumes that you’re marketing to people in Canada. Here’s the problem in a nutshell: you need a separate SKU for all items that you sell in Canada. Your American SKU isn’t allowed in that country. Fortunately, you can “Canadize” your American SKU by just adding -CA to it. That might be all you want to do to overcome the problem. If you don’t handle the problem correctly, though, you might cause some headaches for yourself later on as Amazon’s inventory system ends up out of whack. That’s why it’s best to know about the NAUA inventory issue up front and have a plan to deal with it. Another problem with global marketing on Amazon: reviews aren’t international. That means if somebody buys your product in the U.S. and writes a glowing review, the U.K. customers who view your product online aren’t going to see that review. Of course, that’s a two-edged sword, isn’t it? If somebody in the U.S. left a bad review, then people in other countries won’t see that, either. Still, it’s good for customers to have reviews to browse. Fortunately, Amazon does provide a link at the bottom of the product detail page that people can click to see reviews from other marketplaces. Customers will have to go out of their way to do that, though. Of course, price adjustments are another issue when you go international. Although, as we’ve seen, the ACCS can help you out, you’ll still have to do some research to market your product a reasonable price in a new region. Also, there can be significant marketing differences in other countries. The kind of “best practices” that you’re accustomed to using in your native country might fall flat in Japan (hint: they probably will). That means you’ll have to get with an expert, read a book or two, and browse some blogs to learn about the most effective ways to reach people in the region that you’re targeting. Along those lines, don’t expect to figure out international marketing overnight. In fact, you should expect that there will be a learning curve that’s approximately the size of the St. Louis Arch. This is a whole new ballgame. You’ll have to endure a baptism by fire and learn some of the rules as you go along. Also, you’ll have to decide on which markets to enter. You might think that your blue widget will sell very well in India, but do you really want to start by marketing to people in a completely different culture before you branch out into Europe? You’ll have to deal with addressing issues as well. If you’re accustomed to mailing your products to people in the United States, you can expect the address to follow the pattern of a 3- or 4-line template. When you go international, throw that template in the trash. You’ll likely see address formats that vary wildly from country to country. You’ll probably have to update some of your business software to handle the new types of addresses. Of course, you’ll also have to deal with translation issues in some countries. Although, as we’ve seen, Amazon can handle customer service in the native language of your buyers, you’ll still need to market to those people in their own language. That’s going to be an added marketing expense. Beyond that, there are regulatory issues that vary from country to country as well. Although it’s typically a “caveat emptor” environment in the U.S., other countries might have stricter consumer protection laws. Be sure that you’re familiar with those laws before you go into that market. Also, if you’re going into Europe, you’d better familiarize yourself with the Value-Added Tax (VAT). There are horror stories of innocent sellers on Amazon who get slapped with a huge tax bill by European authorities because they simply weren’t aware of the VAT. There are also geopolitical ramifications to think about when going international. Do you know which countries will be at war a year from now? Of course not, which is why you need a risk-management strategy in place. Also, do you know how President-elect Trump’s protective trade policies will impact other countries? That’s another source of concern as you contemplate global marketing. Finally, you’re going to deal with competition when you move overseas. That’s because other Amazon sellers in your home country are recognizing the opportunity that exists in international marketing as well. So when you go international, be ready to compete for every customer. Once you’ve weighed the pros and cons of selling internationally on Amazon and decided that it’s in your best interest to move forward with marketing your products in other countries, it’s time to start selling on Amazon. For starters, you’ll need to create an account for the country where you want to sell. For example, if you want to sell products in Spain, you’ll need to create an account on Amazon.es. Remember, though, that Amazon offers a couple of “consolidated” account options. That means if you create an account on a European website, you can market your products to any other country in the European marketplace. Similarly, when you sign up for a North American account, you can market to other countries in North America. The bottom line: you’ll have to manage multiple accounts when you go international, but Amazon tries to make it easy so that you don’t have to manage too many multiple accounts. Start here to begin the process of registering to sell on the international marketplace. Just select the country of choice and Amazon will guide you through the whole process. Keep in mind that all of your legal i’s must be dotted and legal t’s must be crossed before you can register. For example, you’ll need your business name or d/b/a that you’ll be operating under. Also, you’ll need a Tax ID if you’re in the U.S. It’s easy enough to get one from the IRS if you don’t already have one. If you’re selling in Europe, you’ll also need a VAT registration number. If you haven’t already done so, you can get that ball rolling by clicking here. Of course, you’ll also need to add bank account information. That’s how Amazon will pay you when people buy your products. Additionally, you’ll be required to set up state tax collection if you’re in the U.S. That process will vary from state to state depending on how your state collects taxes. Once you’re done with all of those preliminaries, it’s time to set up FBA if that’s how you’ve decided to go. As we’ve seen, it’s probably in your best interest to use FBA at first, especially if you’re just getting started in the global marketplace. If you’re selling in Europe, then you’ll need to decide if you want to use EFN or MFN. Although you can certainly provide better customer service with MFN, it’s probably best not to bite off more than you can chew when you’re just starting out. Go with EFN at first and then switch to MFN later once you’ve got some experience with international marketing. Once your account is set up, it’s time to start adding product info. Fortunately, if you’ve already added products on Amazon in your own region, then you’ll find that the whole process is very similar to adding products in other regions. Of course, you’ll also need to translate your product listings into the country’s native language. You might think that you don’t need to be bothered with that process if you’re just reaching out to the U.K., but keep in mind that there are spelling variations in that country (“colour” versus “color”) that you’ll likely need to handle. Beyond that, you’ll need to enlist the aid of somebody who knows the language of your new target market. Keep in mind that you want an expert here or you’ll come across like some of the sellers on Ali Baba and Ali Express who often use tortured English to describe their products. Once you’ve completed listing all your products, it’s time to send your inventory to the Amazon fulfillment center (presuming you’ve opted to use FBA). Fortunately, Amazon offers shipping discounts for FBA sellers. Keep in mind, when you send your inventory to another country, that’s a whole different ballgame than shipping your inventory to a fulfillment center in your home country. For starters, you become an exporter. That means you’ll have to comply with laws and regulations associated with exporting to the other country. Also, you might be subject to taxes, fees, and custom duties levied by the destination country. That’s a business expense you’ll have to prepare for. Amazon will ship your whole inventory back to you if it arrives at the fulfillment center with duty charges due. Once your products have arrived at the fulfillment center, Amazon will clear your products for listing. Then, it’s time to start selling! You might decide that you want to do some additional advertising on Amazon’s regional sites to give your product a bit of an edge in the new country. Alternatively, you might use region-specific SEO to optimize your Amazon listing. Keep in mind, though, that digital marketing in a foreign country is also a discipline with a steep learning curve. Prepare to learn on the go. The good news at this point is that you’re now a global seller. Congratulations and good luck!